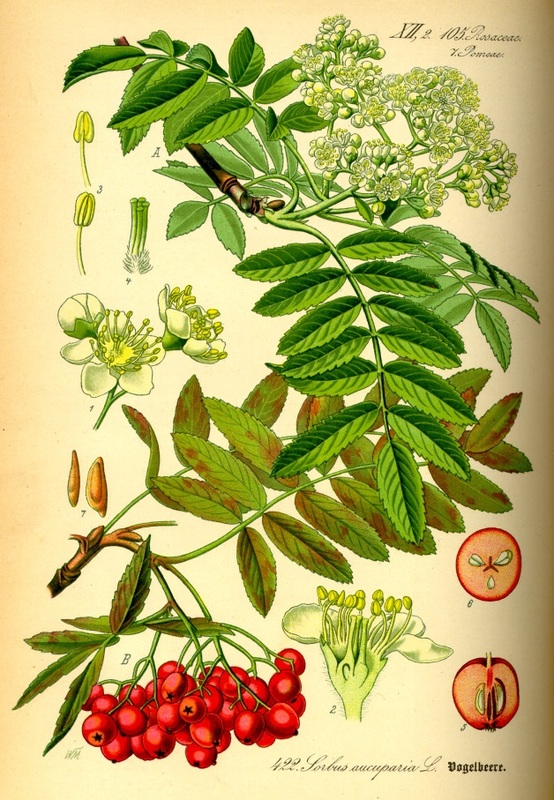 Sorbus aucuparia.de wikipedia.org (Accessed 5/2014). Sorbus aucuparia is a tree to 10 m tall, young branches white-hairy; stipules on young stems, about 0.5 cm, deeply toothed. Leaves alternate, pinnately compound to 22 cm long, leaflets almost sessile, 9-15, to 5 cm long, oblong, tip pointed, base rounded, margin toothed, or double-toothed, dull green above, pale-hairy below. Flowers white, radially symmetrical, 5 petals, stamens 15-20; inflorescence branched, flat-topped, to 15 cm wide. Fruit fleshy, bright red, 1 cm wide, berry-like (a pome) with several seeds. Habitat: Escaped from cultivation, prefers soil pH 5.5-7.5 (USDA, NRCS 2010). Notes: Numerous cultivars and hybrids with native (Sorbus americana) and Asian species.